Supreme Ultimate Diagram–Taiji Tu-1623 CE. (Traditional Chinese: 太極圖; Simplified Chinese: 太极图); representing the unity and diversity of all things through the interactions of yin and yang. The basic stuff out of which all things are made is called qi. Everything that ever existed, at all times, is made of qi, including inanimate matter, humans and animals, the sky, ideas and emotions, demons and ghosts, the undifferentiated state of wholeness, and the world when it is teeming with different beings. 1. "Psychophysical Stuff"— because it involves phenomena we would consider both psychological, as in connected to human thoughts and feelings, and physical. 2. "Pneuma"— because one early etymology of this word is "vapor," "steam," or "breath"; the same as the early etymology of the word qi itself. 3. "Vital Energy"— because this accentuates the potential for life inherent in the more ethereal forms of qi. These meanings of qi hold for most schools of thought in early Chinese religion. 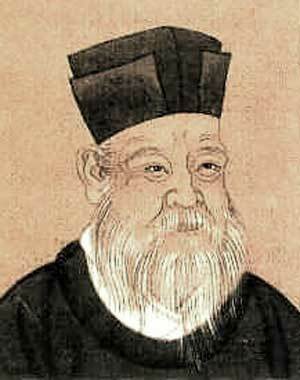 It is only with the renaissance of Confucian traditions undertaken by Zhu Xi and others that qi is interpreted not as a single thing, part-matter and part-energy, pervading everything, but as one of two basic metaphysical building blocks. According to Zhu Xi, all things partake of both qi and li (homophonous to but different from the li meaning "ritual" or "propriety"), the latter understood as the reason a thing is what it is and its underlying "principle" or "reason." 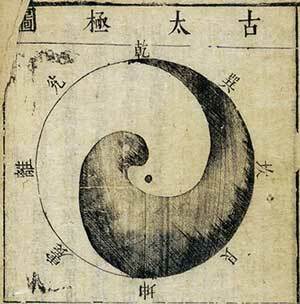 While traditional cosmology remained monistic, in the sense that qi as the most basic constituent of the universe was a single thing rather than a duality or plurality of things, still qi was thought to move or to operate according to a pattern that did conform to two basic modes. The Chinese words for those two modalities are yin and yang. I shall attempt to explain them here but shall leave them untranslated. Yin and yang are best understood in terms of symbolism. When the sun shines on a mountain at some time other than midday, the mountain has one shady side and one sunny side. Yin is the emblem for the shady side and its characteristics; yang is the emblem for the sunny side and its qualities. Since the sun has not yet warmed the yin side, it is dark, cool, and moist; plants are contracted and dormant; and water in the form of dew moves downward. The yang side of the mountain is the opposite. It is bright, warm, and dry; plants open up and extend their stalks to catch the sun; and water in the form of fog moves upward as it evaporates. This basic symbolism was extended to include a host of other oppositions. Yin is female, yang is male. Yin occupies the lower position, yang the higher. Any situation in the human or natural world can be analyzed within this framework; yin and yang can be used to understand the modulations of qi on a mountainside as well as the relationships within the family. Reprinted from Religions of China in Practice ed. by Donald S. Lopez, Jr. Copyright ©1996 by Princeton University Press. Reprinted by permission.